On Saturday, December 10th, a franchise record was tied. 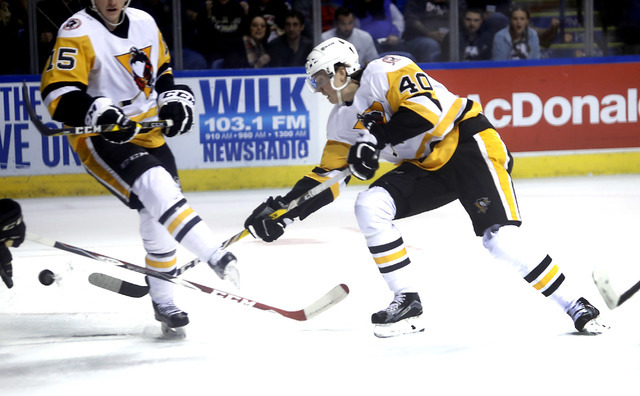 Oskar Sundqvist, a Pittsburgh Penguins prospect, scored four goals for the Wilkes-Barre/Scranton Penguins in a 6-2 win over the Hershey Bears. The other two goals were scored by Tom Kostopolous and Jake Guentzel (GWG). Oskar Sundqvist was the first star of the game, while Jake Guentzel and Tom Kostopolous were the second and third stars, respectively. Fitting. Not only was this the first four-goal game of Sundqvist's pro career, it was the first hat trick of his pro career. And it started a comeback which enabled the Penguins to win the game. Sunny said he can't remember ever scoring 4 in a game before and that his last hat trick came in junior. The Penguins were down 2-0 to the Bears in the first period, and Sundqvist's first got the comeback rolling. The only two other Wilkes-Barre/Scranton Penguins to score four goals in a game are Erik Christensen (10/5/05) and Jean-François Jacques (2/16/07). Sundqvist leads the team with 11 goals to this point. Something else to note is that this marked Jake Guentzel's second straight 2-point game since being reassigned to the Wilkes-Barre/Scranton Penguins. Chandler Stephenson and Christian Djoos scored for the Hershey Bears. Also, during the game, Joey Leach had a nasty knee-on-knee hit on Penguins Josh Archibald. Leach was assessed a five minute major and a game misconduct for the hit. Following the hit, Archibald needed to be helped off ice, while putting no pressure on his leg. Head coach Clark Donatelli gave us some good news, however. Coach Donatelli says in postgame presser that Archibald has a LBI, but it's not his knee. Said it was "good news". No time frame yet. Next year, with the UFA statuses of Nick Bonino and Matt Cullen, it is very likely Oskar Sundqvist will be an NHL regular at center.